مدلسازی عامل- مبنا (ABM) رویکردی نوین جهت توسعه‌ی ابزارهای شبیه‌سازی برای پدیده‌های پیچیده در حوزه‌های مختلف از جمله بلایای طبیعی، مطالعات بیولوژیکی و شرایط امداد و نجات زلزله است. این مقاله یک سیستم شبیه‌سازی برای عملیات امداد و نجات با استفاده از سیستم اطلاعات مکانی (GIS)،سیستمهای چندعاملی (MAS)ومفهـوم هماهنگ‌سازی برای انتساب پویای وظایف بین عامل‌های جستجوگر و عامل‌های آزادساز را ارائه می‌دهد. هدف اصلی این مقاله استفاده ازسیستم‌های چندعاملیبرایشبیه‌سازی فعالیت‌ها، افزایش کـارایی گروه‌های امداد و نجات و ارائه راهکاری جهت یافتن رابطه‌ی بین تعداد عامل‌های جستجوگر و آزادساز با در نظر گرفتن حداکثر تعداد شهروندان نجات یافته می‌باشد. این سیستم می‌تواند برای مدیریت و تصمیم‌گیری قبل از زلزله استفاده شود. به عامل‌های آزادساز تخصیص داده می‌شوند. نتیجه‌ی این تحقیق در قالب نموداری که رابطه‌ی تعداد عامل‌های جستجوگر و عامل‌های آزادساز (با توجه به تعداد افراد نجات یافته، در صورت هماهنگی عامل‌ها) را نشان می‌دهد ارائه شده است. نتیجه‌ی حاصل الگویی در یافتن تعداد افراد مورد نیاز برای عملیات امداد و نجات در بخش‌های مختلف شهری و برقراری تعادل بین تعداد نفرات را ارائه می‌دهد. Disasters such as earthquakes have always been a serious threat to human life in urban environments. People have always sought to reduce the financial and human damages caused by such disasters. Large scale earthquakes and rapid changes in the environment make the people unable to deliver the optimal solution to save lives and minimize damages. The earthquake has destroyed streets, roads and other infrastructures, and also causes fire. Fires which are started by earthquake, destroy homes in the city. During different periods of time, earthquake damages on Iranian society in social and economic fields are clear, therefore, dealing with the crisis in the form of a proper management and optimization is absolutely necessary. Complicated access to the earthquake-stricken areas, is always along with the difficulty of the rescue operations. Management structures can only overcome the prevailing political situation in these difficult circumstances that the acceptable level of cohesion and flexibility are paramount. The importance of intelligent systems that can help rescue the human species is very obvious. Agent-based Modeling (ABM) is a new approach to the development of simulation tools for complex phenomena in different areas such as natural disasters, biological studies, and earthquake rescue. This paper presents a simulation system for the search and rescue (SAR) operation using Geospatial Information System (GIS), multi-agent systems (MAS) and the concept of integration for dynamic task allocation. Due to the flexibility of the agent based systems and the possibility of combining space and time, MASs can be a powerful tool in the simulation of rescue operations and strategic management issues. These systems can simulate all factors in earthquakes such as people, robots, helicopters, and vehicles to communicate and cooperate with each other to solve the distributed problems. In several studies, the high capability of using agent-based Modeling structures to model human behavior as a part of an environment to coordinate the rescue operation is referenced. The use of the agent-based Modeling and the possibility of combining flexibility with respect to location and time of the simulation can be a powerful tool in their search and rescue operations and strategic management issues. There are many reasons to use multi-agent systems to manage the crisis. Multi agent systems make it possible to simulate the demolition of buildings and homes, the fire, firefighters' activities, urban infrastructure damages, injured and displaced, and the victims, so they can find optimal strategies for search and rescue operations in large-scale accidents and crisis management performance in which multi-factor systems are used. Multi-agent systems are allowed to participate in environment to cooperate or compete with the environment. Multi-agent systems are targeted complex systems with an emphasis on the interaction between agents. They can break complex systems into sub-systems and other simple factors in environments. Various studies have stated that MASs possess high potentials for natural disaster management, from rescue operation to locating the positions of injured persons. The main object of this paper is to use multi-agent systems to simulate activities and increase the efficiency of rescue groups. This research tries to offer a way to find relationship between the number of search agents and rescue agents with regard to the maximum number of surviving people. This system can be used for managing and decision-making before the earthquake. Evaluation of the developed system took place in a part of Region 3 in Tehran. The proposed system consists of three parts: 1) Modeling environment and working groups with the use of GIS, analysis of the search operation by multi-factor system and visualization of the results. Therefore, environment has been modelled using spatial data, and the amount of space that each agent must search, is assigned for each agent. 2) Then, each of the search agents uses the ant colony algorithm for sequencing tasks in order to find a near-optimal solutions to look for environment. 3) The injuries that are found by search agents are assigned to rescue agents through net contract and then operation is executed. The Result of this research is shown in the form of a diagram which highlights the relationship between the number of search agents and release agents (according to the number of survivors, and is done). The result offers a model in finding the number of people needed for rescue operations in different parts of the city. 1. آقامحمدی، مسگری، نورجو؛ حسین، محمدسعدی، رضا، (1384)،مدلسازی مکانی برای کاهش خسارت‌­های بحران زلزله در ایران، همایش سیستم‌­های اطلاعات مکانی 84 تهران. 2. 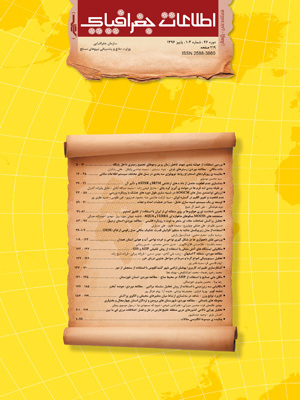 بهرامیان، خادمی؛ فاطمه، مریم، (1392)،سیستم‌های داده کاوی توزیع شده چند عامله، اولین همایش ملی کاربرد سیستم‌­های هوشمند (محاسبات نرم) در علوم و صنایع، قوچان - دانشگاه آزاد اسلامی واحد قوچان. 3. جباری، عشری، میبدی؛ زهرا، مهدی، محمدرضا، (1386)، هماهنگ‌سازی سیستم‌های چند عامله با استفاده از اتوماتاهای یادگیر و کاربرد آن در خوشه‌­بندی داده، سیزدهمین کنفرانس سالانه انجمن کامپیوتر ایران، کیش، انجمن کامپیوتر ایران و دانشگاه صنعتی شریف. 4. حسینعلی، آل‌شیخ، نوریان؛ فرهاد، علی‌اصغر، فرشاد، (1391)، توسعه مدلی عامل-مبنا برای شبیه‌سازی گسترش کاربری اراضی شهری (مطالعه موردی: قزوین)، فصلنامه مطالعات و پژوهش‌های شهری و منطقه‌ای، سال 4، شماره 14، صص 1-22. 5. خالوزاده مبارکه، خالوزاده مبارکه؛ لیلا، مرضیه، (1390)، ارائه یک الگوریتم تخصیص کار جدید جهت کاهش ارتباطات بین عامل‌­ها در سیستم‌های چند عاملی، اولین کنفرانس ملی دانش پژوهان کامپیوتر و فناوری اطلاعات، تبریز - دانشگاه تبریز. 6. خجسته، میبدی؛ محمدرضا، محمدرضا، (1382)، ارزیابی اتوماتاهای یادگیر در همکاری بین عامل‌ها در یک سیستم چند عامله پیچیده، پنجمین کنفرانس سراسری سیستم‌های هوشمند، مشهد - دانشگاه فردوسی مشهد. 7. شریفی­ سده، مهراب، (1391)، تیم سازی و کار تیمی در عملیات امداد و نجات، مؤسسه آموزش عالی علمی کاربردی هلال ایران. 8. شهبازی، آقایی، موحدی؛ حامد، ناصر، مصطفی، (1390)، عامل‌های هوشمند در شبیه سازی امداد و نجات. 9. صبامنیری، معصومی، میبدی؛ سعید، بهروز، محمدرضا، (1388)،ارائه روشی نوین در سیستم‌های چند عامله با استفاده از استنتاج مبتنی برمورد همکارانه برای تخصیص منابع، پانزدهمین کنفرانس بین‌المللی سالانه انجمن کامپیوتر ایران، تهران - انجمن کامپیوتر، مرکز توسعه فناوری نیرو. 10. صداقت، محمد (1391)، کاربرد سیستم‌های هوشمند در عملیات امداد، چشم‌اندازها و چالش‌ها، مجموعه مقالات ششمین همایش دانشجویی مهندسی کامپیوتر. 11. عسگری مهرآبادی، مسگری، علی محمدی، خطیبی؛ محمدحسین، محمدسعدی، عباس، صنم، (1392)، توسعه یک مدل پویای عامل مبنا جهت ایجاد اولویت کاربری برای هرقطعه زمین، کنفرانس بین‌المللی عمران، معماری و توسعه پایدار شهری، تبریز - دانشگاه آزاد اسلامی واحد تبریز. 12. قربانی، معصومی؛ امیرعباس، بهروز، (1390)،ارایه مدلی ترکیبی برای ایجاد هماهنگی در سیستم‌های چند عامله با استفاده از بازی اقلیت و یادگیریQ، پنجمین کنفرانس داده کاوی ایران، تهران، دانشگاه صنعتی امیرکبیر. 13. وفائی‌نژاد، علیرضا، (1388)، مدلسازی و برنامه‌ریزی مکانی- زمانی گروه‌های کاری در GIS فعالیت مبنا (پایان­‌نامه دکتری)، همراه، مجید و آل‌­شیخ، علی اصغر، دانشگاه خواجه نصیرالدین طوسی، گروه سیستم اطلاعات مکانی. 14. Anh, N. T. N., Zucker, J. D., Du, N. H., &Drogoul, A., (2012),Hybrid equation-based and agent-based modeling of crowd evacuation on road network, Proc. ICCS, 456-466. 15. Crooks, A. T., & Wise, S., (2013), GIS and agent-based models for humanitarian assistance,Computers, Environment and Urban Systems, 41, 100-111. 16. Edrissi, A., Poorzahedy, H., Nassiri, H., & Nourinejad, M., (2013), A multi-agent optimization formulation of earthquake disaster prevention and management,European Journal of Operational Research, 229(1), 261-275. 17. Erick, M., Anawat, S., Fumihiko, I., & Shunichi, K., (2012), Agent-based Simulation of the 2011 Great East Japan Earthquake/Tsunami Evacuation: An Integrated Model of Tsunami Inundation and Evacuation,Journal of Natural Disaster Science, 34(1), 41-57. 18. Fecht, D., Beale, L., & Briggs, D., (2014), A GIS-based urban simulation model for environmental health analysis,Environmental Modelling & Software, 58, 1-11. 19. Qiu, F., Li, B., Chastain, B., & Alfarhan, M., (2008), A GIS based spatially explicit model of dispersal agent behavior,Forest Ecology and Management, 254(3), 524-537. 20. Uno, K., & Kashiyama, K., (2008), Development of Simulation System for the Disaster Evacuation Based on Multi-Agent Model Using GIS,Tsinghua Science & Technology, 13, Supplement 1, 348-353. 21. Welch, M. C., Kwan, P. W., & Sajeev, A. S. M., (2014), Applying GIS and high performance agent-based simulation for managing an Old World Screwworm fly invasion of Australia,Acta Tropica, 138, Supplement, S82-S93.